The Knucklehead Radar is all about situational awareness, but how necessary is it these days? The point of an exotic in Destiny 2 is to provide a unique intrinsic perk that gives players a new angle on their subclass or approach to an activity. Some exotics do this very well, and some fall flat on their face. 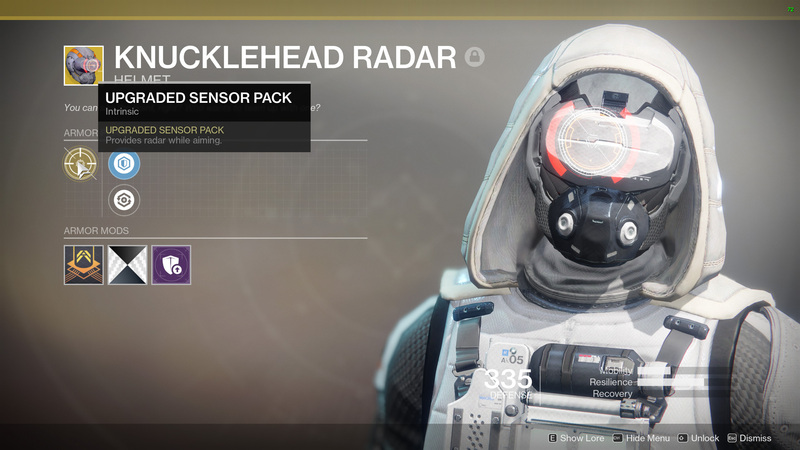 Knucklehead Radar, the exotic Hunter helmet I’ll be looking at today, doesn’t quite fall flat on its face, unless you’re planning to wear it in a PvE situation. Knucklehead Radar has an intrinsic perk called Upgraded Sensor Pack. This perk gives you the ability to see your radar as you are aiming down sight, much the same way that the MIDA Multi-Tool does. The difference, is that Knucklehead Radar applies this perk across all weapons so long as you’re wearing it, while the MIDA Multi-Tool only provides a radar while you’re aiming down sight with that weapon. The Knucklehead Radar also comes with the Plasteel Reinforcement Mod, providing increased resilience for your build. When it comes to PvP, I can’t say enough good things about Knucklehead Radar. The older I get, the slower I am when it comes to PvP situations, and having a permanent radar allows me to anticipate where the fight is coming from, rather than depend on my slowing reflexes to win battles. My case for Knucklehead Radar gets stronger because I’m normally wearing the Celestial Nighthawk in PvE, since the Gunslinger subclass with the Golden Gun super ability is my favorite configuration. The Celestial Nighthawk is useless in the Crucible, though, since it causes you to fire a single Golden Gun round instead of three. Guardians die with a single, normal Golden Gun round, so why load up on damage and limit the number of shots you can fire? This makes taking Knucklehead Radar a more natural choice. Of course, many people aren’t into the Gunslinger subclass, and might instead prefer a Nightstalker or an Arcstrider. In that case your meta exotic setup would be the Orpheus Rig for the former and Raiden Flux for the latter. Both great PvE choices, but neither is really that helpful in PvP. Orpheus Rig probably won’t help you since there aren’t enough enemies to tether, and Raiden Flux doesn’t make a lot of sense since there aren’t that many Guardians on the map to kill. No, in both cases I’d still find maximum value with the Knucklehead Radar. Situational awareness is everything. Where Knucklehead Radar takes a dive, though, is in PvE. I don’t think I ever look at my radar when I’m in a PvE activity. Most of the environments are designed in a way that you know where all the threats are coming from. If not the first time, then as you gain experience. Why waste your exotic armor piece on a permanent radar that you’ll never use? Instead, go with one of the three options that I tossed aside when you’re in PvP; Celestial Nighthawk, Raiden Flux, or Orpheus Rig. In my opinion, the Knucklehead Radar is a PvP only exotic Hunter helmet. You can get more of my opinions on the gear and activities in Destiny 2 by visiting the Shacknews Destiny 2 complete strategy guide.